Makes 28 – 30, 5 cm. ravioli. 6-8 people as an appetizer, 4 persons as a main course. This is a great dish, very elegant, but it does take a bit of time to prepare. I think it’s really worth the work. Follow it up with something that is easy to make such as a small roast or racks of lamb. Makes 28 - 30, 5 cm. ravioli. 6-8 people as an appetizer, 4 persons as a main course. Begin with the beets, preheat the oven to 180 degrees. Wash the beets well and dry them. Do not peel them. On a piece of aluminum foil take the 1 tbsp of oil and rub all the beets, sprinkle over the sea salt and roast for 1 hour. You can check them after 45 minutes. When done let them cool and peel them wrap and set a side. While the beets are roasting make the pasta dough and the filling and let them both rest. Place the flour and eggs with a big pinch of salt in the bowl of a food processor and pulse until the dough comes together. Remove it from the machine and knead for 10 minutes. When done dust with a bit of flour place it in a plastic bag and leave it in the refrigerator to relax for about an hour. You want a pretty stiff dough to work with so add a bit of flour while kneading if the dough is too moist. In the bowl place the ricotta, grated Parmesan, the Chèvre (minus the rind), and the egg yolks and season with a little salt and a little fresh black pepper, keeping in mind that the Parmesan is salty (so taste as you go). Mix well and place in the refrigerator to get cold, this should take an hour or two and will help when making the ravioli. Making the ravioli: I get 28 to 32 ravioli from each batch of dough and filling. When the pasta dough has rested, roll out ¼ of the dough until it passes through the second to last gear or the one that is next to last setting on the pasta machine. Take a large 1 teas. of filling, and arrange them in rows of 2 on the sheet of pasta dough with about 3- 4 cm. or 1 ½ inches between each spoonful. Roll out another ¼ of the dough and take one beaten egg yolk or a bit of water on a pastry brush and brush the bottom layer of pasta to help seal the ravioli. Take a second length of dough and drape it over the bottom piece, removing as much air as you can, gently pressing down with your fingers, now cut with a round 6cm or 2 1/4inch crimped cookie cutter. If you don’t have one you can always make them using a glass or in the traditional square shape by cutting them with a knife. To seal, take each ravioli in your hands and force out any excess air, if you don't expanding air can make the ravioli explode or open once you have dropped them into the boiling water. Then with your fingers press the edges firmly together taking care not to deform the ravioli too much. Flour a large flat dish or tray (or sprinkle with course semolina) and set each ravioli (do not let them overlap) on it as you finish them and place in the refrigerator until ready to cook. Do not cover them if you are going to use them the same day. If you wish to freeze them, set the tray or dish in the freezer and freeze them before placing them into a freezer container. I don’t recommend plastic bags; I think it is better to place then in some form of flat plastic container with a bit of baking paper between each layer of ravioli. 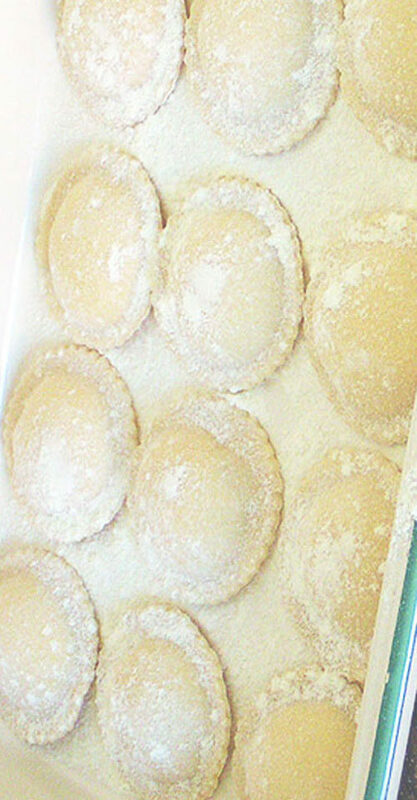 To cook frozen ravioli - don’t defrost them, I just take them directly from the freezer cook them from frozen. This is a great dish but it does take a bit of time to prepare. I think it’s really worth the work. The sauce is not really a sauce either; it’s more like a set a garnishes that you put together at the last minute. You can save time by roasting the beets, cut and blanch the zucchini and reduce the balsamic vinegar all the night before your dinner. You can even make the pasta dough and filling the day before you want them to help save time. I strongly suggest that you make the ravioli the day you need them if your trying to impress friends. I like making ravioli and dumplings, I find it very therapeutic and they have the added benefit of being so fantastic to eat. 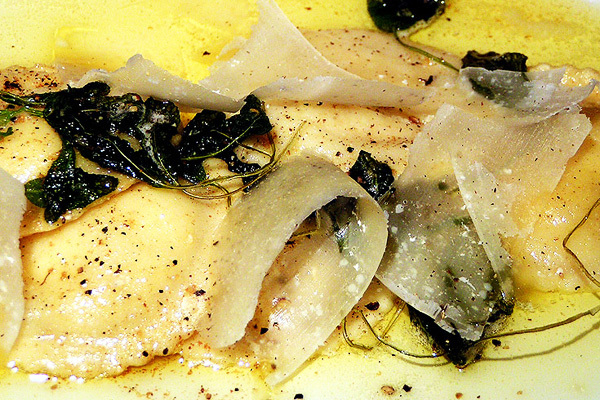 You can also make the ravioli and use a Butter and Sage sauce which only takes 5 minutes to prepare, it’s a classic Northern Italian preparation. It is simplicity at its finest and perfect for warm summer evenings. This recipe is perfect when small fresh sweet beets are just coming into the stores. If you don’t like anchovies try this anyway, there really aren't enough of them to taste like anchovy. They are there to lend a bit of body and background flavor. Another addition to this dish is capers. A few spoonfuls of drained capers would be a great addition.